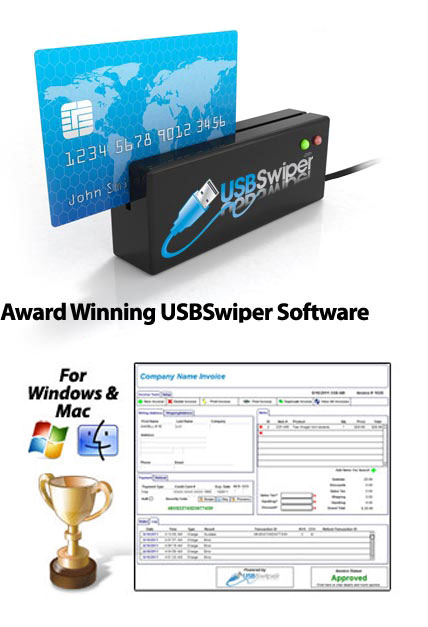 Not only will the USBSwiper.com solution work on both Windows and MAC systems, but doing so will save you potentially thousands of dollars in expensive long term leasing and/or purchasing arrangements for your credit card terminal(s). If you are a growing business or have multiple locations, you can save a tremendous amount of time and money because our system will work on an infinite number of USBSwiper.com credit card processing terminals which will all link to one single merchant account! Our solution and the Credit Card Machine that you will use for taking and processing credit cards will be the equipment you already own… your laptop or desktop computer. Also, because our credit card terminal system is PC based, you are afforded the utmost in flexibility to upload your inventory and other important transaction details into our unique software interface – something a regular credit card machine cannot do! The more you examine the benefits of our credit card terminal system, the more you will be convinced that USBSwiper is the BEST credit card processing terminal for your business. Why lock yourself into long term contracts that end up costing you hundreds or even thousands of dollars in fees for expensive credit card machines that go out of date requiring you to purchase or lease a newer unit time and time again? The inexpensive USBSwiper.com Credit Card Swiper as well as our software interface solution for PayLeap, PayPal, PayFlow, and Authorize.net will give you tremendous savings as well as an easy to use system for accepting credit cards either at your fixed location or anywhere out in the field. Get the flexibility to use either your Windows or Mac based system with one solution that works with both! No need to purchase or lease additional expensive hardware that becomes out of date forcing you to purchase or lease newer equipment. For a simple, easy to use system, there is simply no better credit card processing system or an easier credit card machine for your business than USBSwiper.com. Get started saving money and time NOW!